Tuesdays with AVIS: Hike/Trash pickup with our leader David Dargie (978-996-4475) (david@dargie.com). Parking at Launching Rd. on right just past Mercury Cir. Beaver nature walk: Led by North Shore Nature Programs, northshorenatureprograms.com which is an environmental education organization dedicated to helping students of all ages fall in love with nature. They work with schools, community groups, and individuals to provide engaging, informative programs that help explain the world around us. The nature walk will be led by Dan Holbrook and is open to all ages. This family friendly walk will start at the end of Dale St. and look for all things related to beavers and their habitat along the Shawsheen River on the Vale Reservation. No pets. Tuesdays with AVIS: Hike with our leader David Dargie (978-996-4475) (david@dargie.com). Parking at 491 S. Main St.
9:30-11:30 am Meet at 26 Oriole Drive, Andover. 1:00-4:00 pm Meet on Abbot Bridge Drive, near the intersection of Central Street, Andover. Tuesdays with AVIS: Hike with our leader David Dargie (978-996-4475) (david@dargie.com). Parking at 26 Oriole Dr at Sakowich. Tuesdays with AVIS: Hike with our leader David Dargie (978-996-4475) (david@dargie.com). Parking at the end of Dale St.
Tuesdays with AVIS: Hike with our leader David Dargie (978-996-4475) (david@dargie.com). Parking at Woburn St. on left just past Rattlesnake Hill Rd. Tuesdays with AVIS: Hike with our leader David Dargie (978-996-4475) (david@dargie.com). Parking at Spring Grove Rd. opposite the cemetery. Meet on Abbot Bridge Drive, near the intersection of Central Street, Andover. Six Reservation Bus Tour/Hike: Get on the bus and tour six of AVIS’s smaller reservations. We’ll visit Purdon, Lupine, Greene, Burns, Wilkinson, and Stanley Reservations. Due to the limited number of seats on the bus, please register with Hike Leader, Jeff LaFountain, jefflaf@comcast.net. Tuesdays with AVIS: Hike with our leader David Dargie (978-996-4475) (david@dargie.com). Parking at 3 Monahan Ln. Meet on Monohan Lane, Andover. Five Reservation Bus Tour/Hike:Get on the bus again and tour five more of AVIS’s smaller reservations. This month, it’s the Bonier, Sherman, and Nat Smith Reservations, plus Turtle Mound and the site of the Lowell & Lawrence Railroad. Tuesdays with AVIS: Hike with our leader David Dargie (978-996-4475) (david@dargie.com). Parking at 3 Lakeside Cir. Tuesdays with AVIS: Hike with our leader David Dargie (978-996-4475) (david@dargie.com). Parking at High Plain Rd. across from the leaf compost project. Tuesdays with AVIS: Hike / trash pickup with our leader David Dargie (978-996-4475) (david@dargie.com). Parking at the end of Ravens Bluff. Tuesdays with AVIS: Join our Hike / Trimming trails with our leader David Dargie (978-996-4475) (david@dargie.com). Parking: Sagamore Dr. at Wildwood Rd. Joint Meeting of the AVIS Wardens and the Andover Conservation Commission Overseers. This informative program is a presentation about the invasive species that are on our properties. The presenters are, Chris Polatin, Polatin Ecological Services www.polaitneco.com and Robert Barry, NativeScapes, MA and an AVIS Warden www.nativescapesma.com. Nature's Nation: American Art and Environment: Examines for the first time how American and Native American artists have both reflected and shaped our understanding of the environment. The exhibition traces evolving ideas about the environment — and our place within it — through more than 100 works of art from the colonial period to the present by a broad range of artists. Family Moonlight Snowshoe Trek at the Goldsmith Woodlands: Meet at 5:45 for the 6:00 PM outing. Bring a headlamp or flashlight and enjoy cookies and hot chocolate around a campfire in the woods. Park in front of #491 S. Main St. at the Goldsmith Woodlands entrance. No registration, No pets. Hike if no snow, rain cancels. Leader David Dargie (978-996-4475) (david@dargie.com) and Assistant Leaders Ken Doran and Mark Kaluzny. (Previous years had Cross-Country Skiing, this year we will only have Snowshoeing). August 23rd, 2019 Andover Center for History & Culture, 97 Main Street, Andover. AVIS' 50th Annual Snowshoe Trek at the Harold R. Rafton Reservation: Meet at 9:45am for the 10:00 to 12:00 outing. Park near the leaf composting area on High Plain Rd. No registration, No pets. Hike if no snow, rain cancels. Leader David Dargie (978-996-4475) (david@dargie.com) and Assistant Leaders Ken Doran and Mark Kaluzny. (Previous years had Cross-Country Skiing, this year we will only have Snowshoeing). 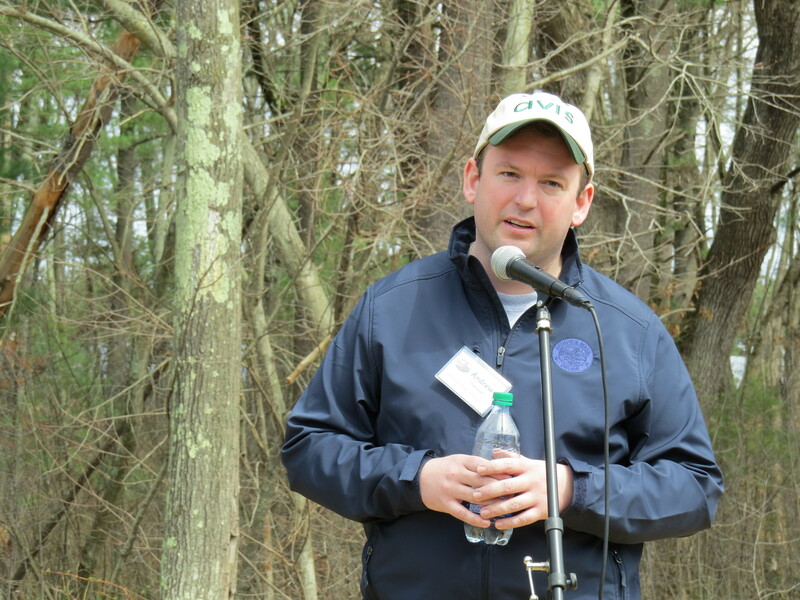 Town Manager Andrew Flanagan speaks to the assembled crowd about the importance of the collaboration between AVIS and the Conservation Commission on the creation of the Meg Batcheller trail through the Sanborn and Lightning Tree Reservations. 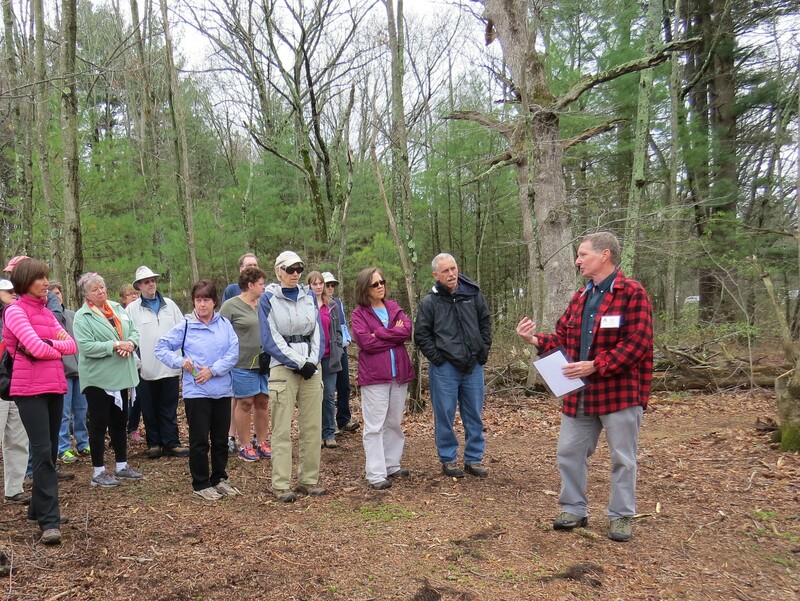 Sanborn Reservation Warden Burt Batcheller speaks to a group while hiking on Meg's Trail as part of the dedication ceremonies held on 4/23/16 for the expanded Sanborn Reservation. 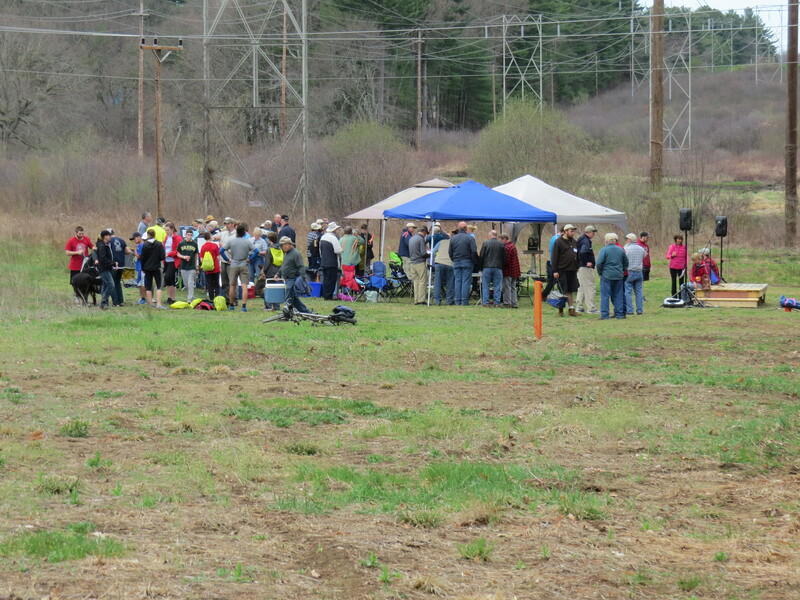 Many of the group of over 120 attendees at the Dedication Ceremony gather for lunch and to hear speakers who emphasized the importance of collaborating to protect the waterfront along the Shawsheen River.